Removing the relatively thick, thermally insulating surface oxide layer, formed as a result of any hot forming process with aluminium products. Providing a flat, smooth surface ensuring maximum surface area contact between component and heatsink. Keeping the junction between component and heatsink free of any thermally insulating coating. - in proportion to the square root of the length (double the length, 40-50% increased heat dissipation). As a result, width is thermally more effective than length. Comparing two heatsinks of similar thermal performance as shown below, the wider heatsink on the right (MF30-50) gives 45% more effective power dissipation per unit volume and weighs 28% less than the heatsink on the left (MF15-151.5). Hence, the inclusion of relatively broad heatsinks into the Conrad range. and weighs 28% less than the MF15-151.5 (left). The heatsink section profiles have been designed to provide an optimum fin profile for a given fin height, length and convection condition. Except for type MF18, Conrad heatsinks are suitable for both natural convection (where plain plate fins have been found to be the most effective) and forced airflow. Adequate section thicknesses are provided to maintain conservative temperature gradients across all heatsink surfaces and ensure ample mechanical strength which is necessary for mounting components (in order to maintain flatness and provide sufficient fastener thread depth) and for applications where the heatsink is used as a structural component (for example, as part of an enclosure). 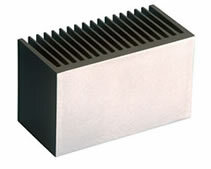 The test conditions for Conrad heatsinks apply to a free standing heatsink in still air with the power applied by a distributed heat source, except where otherwise stated. For type MF18, figures for both natural convection and forced air flow are also given using a distributed heat source. Especially for cooling with natural convection, the hotter a heatsink becomes, the more effectively it dissipates heat. The thermal resistance of a heatsink decreases with an increase in the heatsinks temperature rise above ambient. Please note that the thermal performance at different temperature rises, varies from heatsink to heatsink and that the correction factor K is useful as an approximate guide only. For the heatsink dimensions shown in the following diagrams, tolerances are given in the table below. clogging and result in damage to both the tool and the component.